Hello everyone! 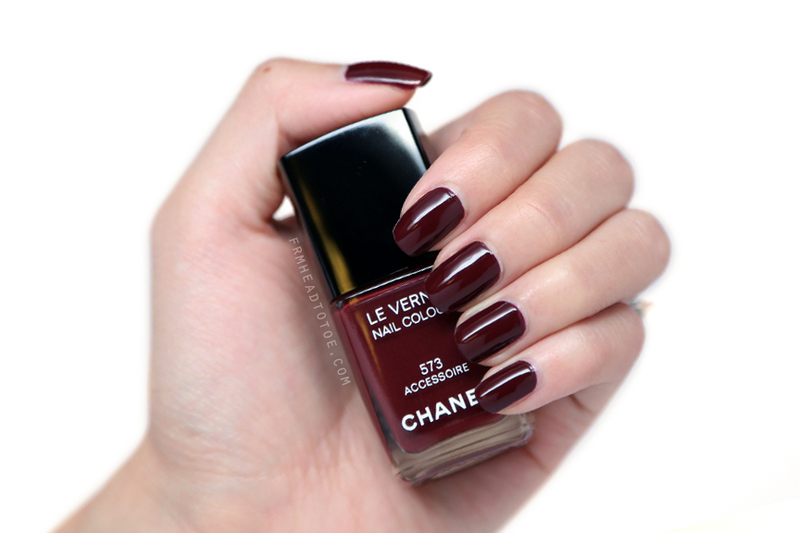 Today I have another Chanel Le Vernis which I am desperately excited to share with you for two reasons. 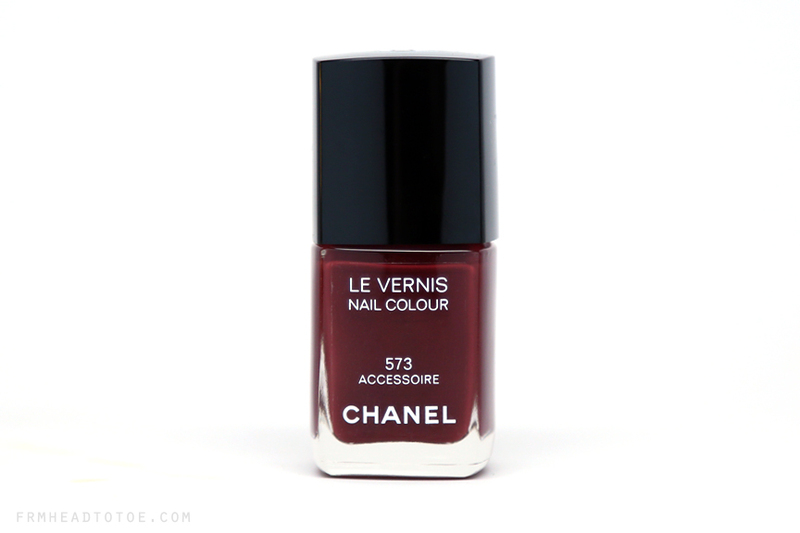 First, if you remember my last Le Vernis swatch, you may recall that it was the first Chanel polish I'd ever tried and I can safely say that after two I am officially obsessed. Second, I have been on the hunt for a vampy, deep burgundy creme-finish polish that is classic and yet low-maintenance and I think I've found it in Accessoire. Lets take a closer look at this decadent varnish below! 573 Accessoire is a dark chocolate burgundy color which seems to drip with old school class. It actually reminds me of vintage film stars with their black winged eyeliner, red lips, and pearl stud earrings. Can't you just imagine one of those actresses wearing this polish? Ever since my move last year and subsequent accidental purge of my beloved vampy dark red creme, I've been on a hunt for a suitable replacement. It's one of those "bucket list" polishes that every woman needs in their nail wardrobe and I cannot tell you the sigh of relief I had after applying Accessoire for the first time. This shade is just what I hoped it to be! Here I'm wearing a base of CND Stickey with 2 thin coats of Chanel Accessoire and 1 coat of Seche Vite. The biggest detail I noticed while applying was just how opaque and smoothly this polish applies. I could tell in the first coat that I wouldn't have to fuss with deciding how many coats I'd need as it was nearly completely opaque at one. The other awesome bonus is that it is also nicely self-leveling and glossy even before a top coat goes on. My nails here look super smooth but my natural nail beds are quite lumpy and for it to look this great with only two coats is impressive! I'm so happy to verify that the quality lives up to the brand name. The one tiny thing I wish they would change is that the width of the brush is quite small so it took double-dipping to cover each nail evenly. It's a small nuisance but worth noting if you are used to OPI's wide, flat brushes. Readers, do you have a "nail bucket list"? What is your favorite classic nail color? Let me know in the comments! This looks great on you! Ugh I am so wanting Chanel Malice but I don't know if that's a seasonal shade that's no longer in stock? I have the exact same shade on my nails right now! Oh, that is such a lovely colour! My nail polish classics are navy and gray. I have to have them in my collection! I love this shade! My favourite classic colours are all the "vampy" reds. It seems I keep gravitating back to the deep reds no matter how many trendy polishes and manicures I try. Such a deep gorgeous color! I was surprised they included it for a Spring collection but it seems like burgundy is still a big color for springtime too, oddly enough! This colour is so gorgeous, love it! This color is amazing!! I've been obsessed with this type of color all winter long!! Lovely colour! Once you start collecting Chanel nailpolishes you'll never be able to stop. 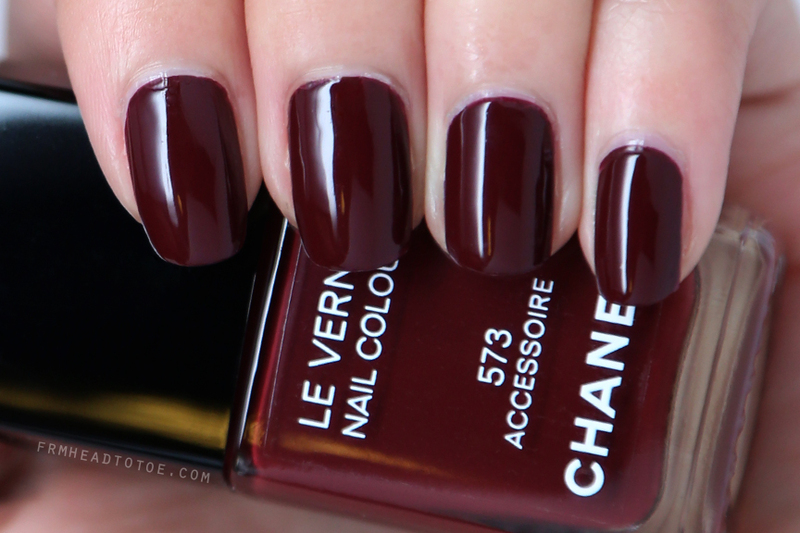 I think a must have colour from Chanel is Rouge Noir. It's a slightly dark red which I love and have gone through muiltiple bottles of. This is a pretty color, almost reminds me of Essie's Carry On! Jen, your nails look flawless! What a beautiful, rich color! !